3 Suites from Recueils de Pièces, petits Airs, Brunettes, Menuets, etc. Flute fanciers will have a field day with more than threehours of works by Michel Blavet, who was born in 1700 and died in 1768. Humblyborn, but talented and ambitious, Blavet quickly became a talented flutist, andby the time he was 23 he had arrived in Paris, where he entered into theservice of Duke Charles-Eugène de Lévis. After a few more prestigious appointments, he became a member of the Musique de Roi, the Roi in question being Louis XV. While serving nobility, Blavet also played a role in the Concert Spirituel, and at the Paris Opéra. Most of his surviving music was written for the flute, although he also wrote several works for the stage. Blavet generally is credited with two innovations. First, he demonstrated to his countrymen that fiery and passionate music could be played on the flute. (Previously, the instrument had been limited mostly to expressions of gentleness and languor.) Second (and related to the first), he introduced Italian elements into French music of the time. For example, he was one of the first French musicians to compose a concerto – a characteristically Italian genre – and he arranged music by Italian composers such as Geminiani and introduced it to French audiences. The first CD contains six "Sonates mêlées de pièces" – inother words, they have more in common with suites than with true sonatas. Composed circa 1732, each one has five or six movements, many with fanciful titles such as "Les Regréts" and "L'invicible." Here, the solo flute is accompanied by viola da gamba and harpsichord, and their contributions are particularly active. 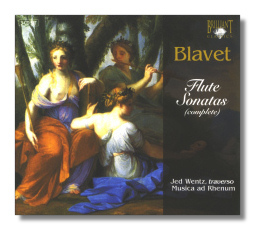 The second CD contains six more sonatas, "for the transverse flute, with basso continuo, by Mr. Blavet." Again, these sonatas are rather freely constructed. Dating from circa 1740, they are in three, four, or five movements, and several of the movements are dance genres, including the "minoetto" [sic], the gavotta, and the giga. In these sonatas, the viola da gamba has been replaced by a cello. The flute is given a more virtuosic role to play in these sonatas, and the Italian influence is more pronounced. Most of the third CD is comprised of the composer's own compilations (recueils) of music not just by himself, but also by Geminiani, Couperin, and other composers. These menuets, airs, and other short works have been arranged for two flutes. This combination of instruments might have particularly pleased the king. Another explanation is that these Recueils seem to have been used as teaching pieces. The concerto that closes the third CD mixes Italian and French styles. Jed Wentz is both scholarly and imaginative in these performances. Wishing to create the optimal match between repertoire and sound, uses three different types of flutes in this collection, each with a distinctive timbre and distinctive but charming quirks – particularly related to pitch. He also has used Blavet's breath marks to guide him in phrasing the composer's melodies, and even to suggest a flexible approach to tempo. These, then, are living, "breathing" (excuse the pun) interpretations. The lively music is truly joyful and exciting, and the more introspective music sings in the most stress-easing manner possible. Wentz's colleagues show as much affect as he does, and their playing is skillful and pleasing to both the heard andthe heart. The engineering is detailed and both clear and warm. Brilliant Classics is a super-budget label, yet many of their releases are of the highest quality. This is one of them!